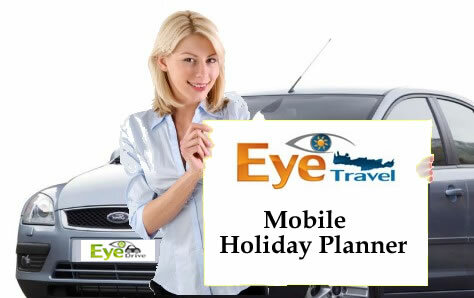 Mobile Holiday Planner on Crete Greece. Personal excursion advice in your hotel. No need to get on the street looking for your daytrip on Crete. Special offers for excursions on Crete. If you can't make a choice right now and want an individual expert advice when you are on Crete and you do not want to cross all the streets in search of information. This option is the solution ! One of our Eye Travel Team, English-speaking, comes along in your hotel or apartment to advise you about all the trips and excursions on Crete so you can make your program. You do not have to leave your hotel or apartment and can ask all questions and sort out everything without any obligations. Use the contact form to make an appointment. Our working range is between Kokkini Chani and Sissi.